“I feel great”! Said Harriett. “Here are a few facts and figures you should know”. On average, the period from first mating to egg laying. “Remember this date: April 9th”. “It is an important date. This is the date from which we will anticipate the upcoming events. Do you have a second egg yet. ? Hope to see one today. It is a beautiful spring day. 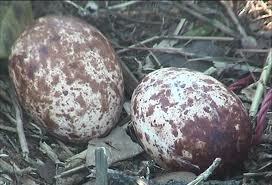 Do Ospreys eat the egg shells after hatching or do they throw them out of the nest ?